Mangrove Jack's Pear Cider - The finest quality pears and essences give a beautiful sweet taste and aroma that extends from the very first contact with your nostrils right through to the aftertaste. Light in colour and refreshingly crisp taste and aroma. The sweet taste of summer. Introducing Mangrove Jack's new line of Premium cider kits. These ciders are a culmination of two years of development using only the finest extracts and highest quality yeasts. Mangrove Jack's extracts have been through extensive screening and they have selected the most appropriate malt and genuine beer yeast strains for each style. The Duo-pack pouch has twin pockets, one for the yeast and one for the cider concentrate. 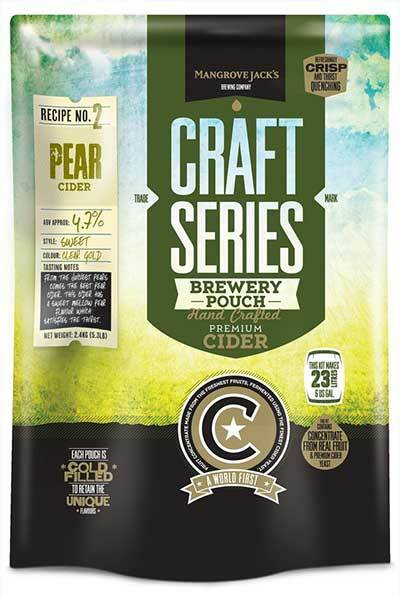 When the top of the pouch is opened, the yeast sachet is removed from one side and the cider concentrate is poured from the other side into the fermentor for brewing.